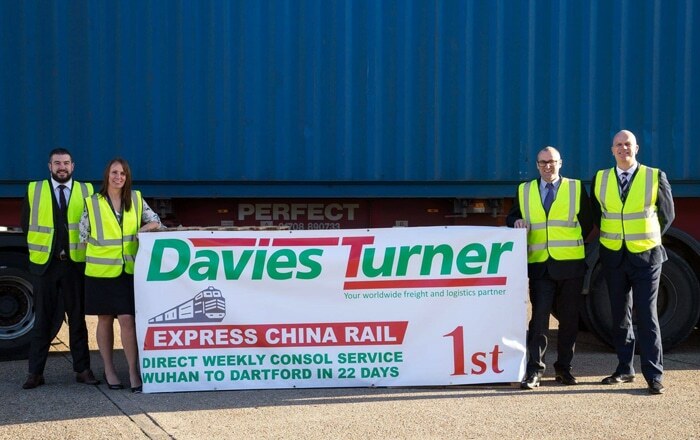 Home Featured Davies Turner’s Express China Rail Service Breaks Records. Davies Turner’s Express China Rail Service Breaks Records. Following an upgrade to its fixed-day, weekly rail import service for LCL cargoes from China, Davies Turner, the UK’s leading independent freight forwarding company, reports record transit times are being achieved. Tony Cole, head of supply chain services at Davies Turner says: “While Storm Gareth caused havoc recently, causing the closure of ports and delays to ocean freight shipments, our Express China Rail service has been suffering no such problems, arriving several days ahead of schedule. “Last week, our consol box arrived and was unpacked after just 19 days, which was a record time. The scheduled transit time from the Wuhan rail hub to our Dartford depot is 22 to 24 days. Davies Turner’s Express China Rail Service sees containers carried by rail from Wuhan directly into Duisburg in Germany. They are then trucked under bond to the port of Rotterdam and transported by ferry to Purfleet, near Dartford for on-carriage by truck to Davies Turner’s distribution centre, where they are discharged, customs cleared and delivered. Freight Association Welcomes HMRC Decision To Extend Transitional Simplified Procedures.